Tonight, I got off the train as usual at Hicksville Station and made my way toward the east side staircase. I expected the usual walk to my car. Instead, I have a story to tell. To best describe the scene, I provide a crude drawing. As you can see, there is a platform with rails on either side. There is a waiting room, which provides relief from bad weather. On rainy or cold days, the room is packed with commuters during rush hour and it smells like a combination of a smoking lounge, public men's room that hasn't been cleaned in several months, a dog kennel, and after-shave. But I'm deviating from topic. 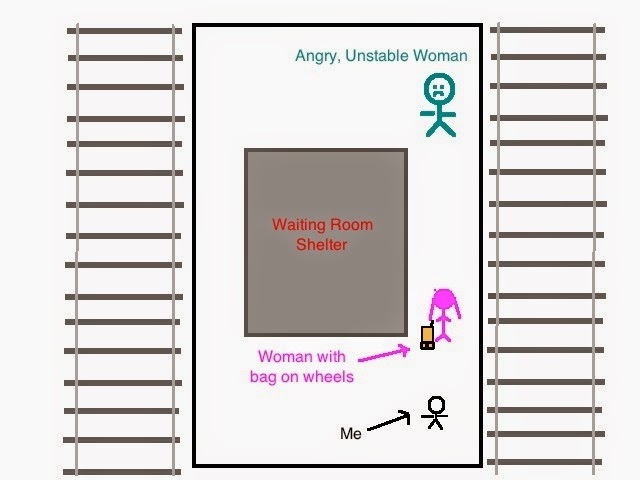 On the right side of the diagram are three people. In the center is a woman colored pink who is dragging a luggage piece on wheels. I am behind her. Walking toward both of us is a woman, colored green. I just noticed that in the drawing, I am a lot smaller than the other two people. I have no body, just arms and legs. I look like a spider with a large head. I have to get better at these drawings. As we converged upon the catwalk area between the waiting room and the platform edge, I could see that the green woman was walking unsteadily. The two women came upon each other. Have you ever walked toward someone and done that dance where you cut to the left and the person coming toward you cuts to the right at the same time? Then you both try to shift in the opposite direction, and you have a little laugh with one another until you negotiate what direction you're both going to go. Then you pass, and you're on your way. That's what happened here. The angry unstable woman screamed at her. "WHY DON'T YOU WATCH WHERE YOU'RE GOING? I'M TRYING TO GET SOMEWHERE. YOU OUGHTA GET YOUR EYES CHECKED YOU STUPID..." On and on she went. She passed both of us, I don't even think she saw me. I felt bad for the woman with the bag, she was just trying to get home and had to eat a scoop of crazy before dinner. Moral: You always lose when you interact with lunatics. And I am not an arachnid, despite playing one in this story. Sign up for the blog mailing list by entering your email address in the "Follow By E-Mail" box. 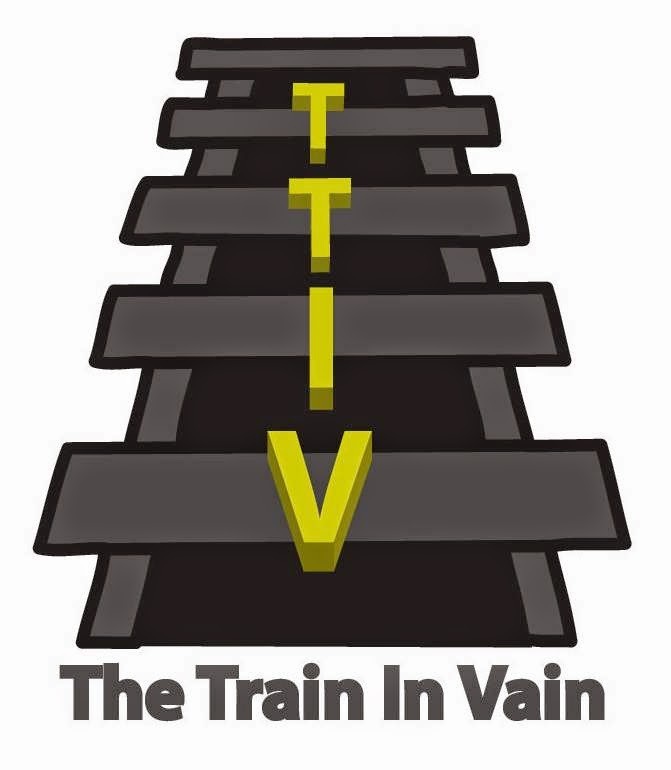 Or, if you're on Facebook, give TheTrainInVain page a "Like." You can also follow on Twitter. That was awesome. I literally laughed aloud at "I have no body, just arms and legs"
I'm glad you enjoyed it. I really do have to get a little better at those drawings.